As we can see in the daily chart,If we label 6342 (3 Nov 2013) to 5972 ( 22 Nov 2013) as wave A, gradually wave has to be labeled at 6415 (9 Dec 2013). The C wave has been confirmed when Nifty breached the 38.2% of wave B. 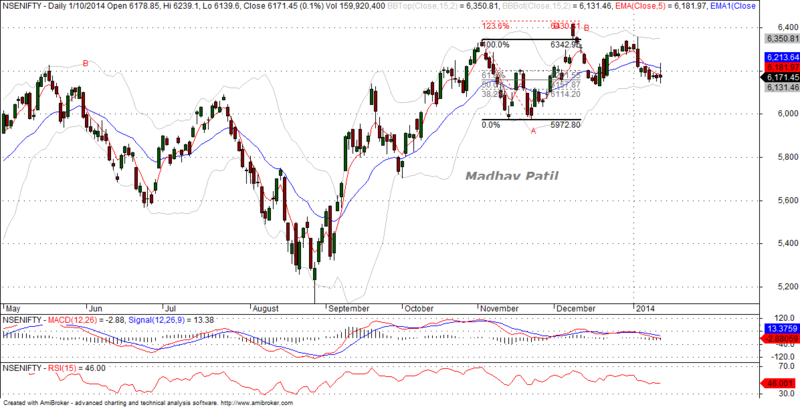 Here Nifty have formed ‘ Flat ‘ where B wave is larger than A wave but fails to exceed above 123.6% of wave A. Now considering these conditions, Nifty have relatively good chance of completely retracing the B wave 5972 but wont be more the 161.8% of wave A ie 5819 level but if it exceeds beyond then it will be considered as ‘Elongated Flat’ which will certainly exceed 161.8% of wave B ie 5698. However, These readings will be negated if Nifty moves above 5415.